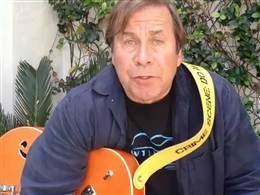 DENNIS MURPHY, of Dateline NBC, is a fingerstyle guitarist and fan of the genre. A question came to me from Dennis that others have asked as well, so I will use it for a ‘Tip From Mark.” Thanks, Dennis! THE TECHNIQUE: To produce this run, I place all four fingertips on the fretted notes of the first string PRIOR to plucking, and then pull them off (or DOWN – toward the floor) consecutively. I don’t slide one finger, which some players have tried. My hand barely moves during this pull-off passage – only my fingers move. But, if it helps, you might try turning your forearm a bit as you pull off – you’ll end up with your palm facing more toward the body of the guitar than the ceiling. Practice this slowly to ensure a steady rhythm, and consistent tone and volume. In the transcription, if the subsequent barre chord at the first fret is too challenging, play the top and bottom notes only, or capo your guitar up two frets for the whole tune. (A capo can make barre chords easier to play.) Or, tune your whole guitar down one half-step, and play it with slightly looser strings in E-flat, a common jazz key! INTRO PLAYED UP ONE OCTAVE: These days I play the intro up one octave, as shown in the example above. This works well if you play a cutaway. (I recorded it on my non-cutaway Collings SJ.) This new high-octave version DOES require one finger (the little finger) to SLIDE to produce all of the chromatically descending notes. While you slide, keep the pressure on the first string to ensure it continues to vibrate. The notation/tab also includes suggestions about how to make a couple of very challenging passages in my arrangement easier to play! A COMPLIMENT! When I was in Germany some years ago, I was paid a compliment by Peter Finger – a virtuoso player, publisher, etc., of Germany’s Acoustic Music. When he watched me play “Take the ‘A’ Train” he called it the best version he had ever heard. Thanks, Peter! Need Help Memorizing a Piece of Music?